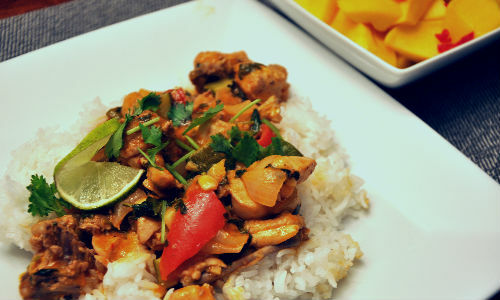 After making this Spicy Thai Red Curry this week, I think I’m going to be a-hankering after curry a lot more. So is my husband. I’ve been requested to make curry at least every other day from now on. I really love to play up the contrast of sweet and heat, so I ramped this up with sweet basil and coconut milk on one side, and plenty of hot pepper on the other. One note on the chicken: In modern American cuisine, traditional recipes have all too often been updated in their calls for boneless, skinless chicken breasts. To our hygienic sensibilities, white meat is seen as the luxury cut—free of skin, bone and anything that might otherwise mar our love for uncomplicated eating. It’s a signal of the availability of choice, and it’s an evolution from the roots of the cuisine in cultures where scarcity demands that no part of the bird go to waste. 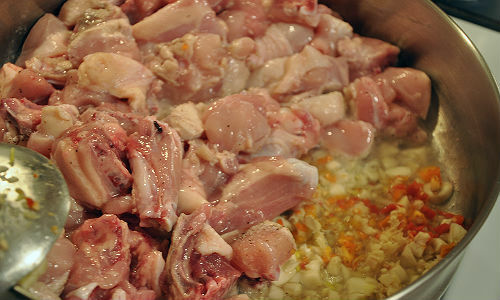 But I’ve discovered the old ways actually make for a more flavorful and juicy dish, so I highly recommend cutting up a whole chicken for the curry—bone, skin and all. One note on pepper. 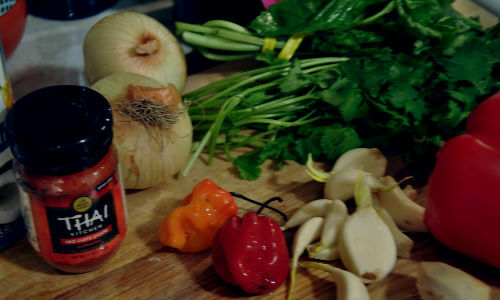 My go-to pepper is habanero, because it has a delicious flavor as well as tremendous heat. There are an abundance of Thai chilies available as well, which I would recommend experimenting with. Just don’t forget to scrub your hands after chopping them up. Yes, I’ve made the mistake of touching my eyes before getting pepper juice off my hands, and it’s pretty bad. So take your cue from me and eat pepper—but don’t bathe in it. 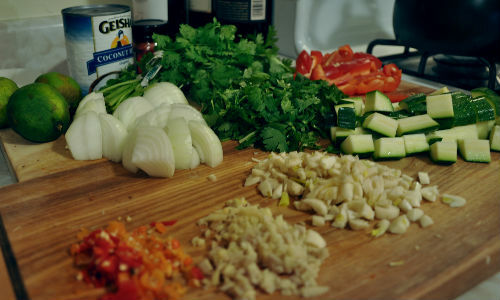 Prepare all your chopped ingredients before you start. Mince your garlic, ginger and hot pepper as finely as you can to ensure the release of maximum flavor into the dish. Drizzle the oil into a skillet over medium-high heat and sauté the onions, garlic, ginger and habanero for a minute before adding in the chicken. Sauté for another 3 or 4 minutes, until the chicken is cooked. Whole chicken tends to release quite a bit of water, but it’s full of flavor and shouldn’t be discarded. 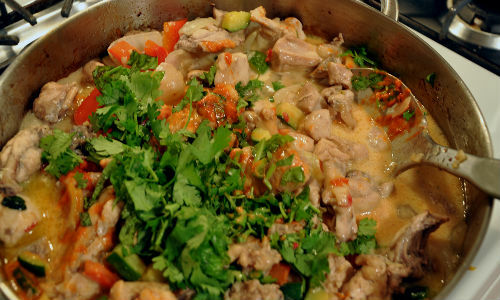 Add the curry paste and veggies into the chicken and continue to cook and stir for another few minutes. Next, blend the cornstarch into the coconut milk and add to the pan. Bring to a simmer and let cook for 5-10 minutes. Finally, just before serving, stir in the basil, cilantro and fresh lime juice. Serve over hot basmati or Jasmine rice. 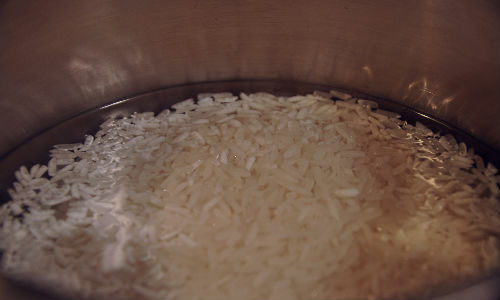 To make the rice, combine 1 1/2 cups cold water and 1 cup Jasmine rice. Bring to a boil, then cover and turn down to low for 15-20 minutes. 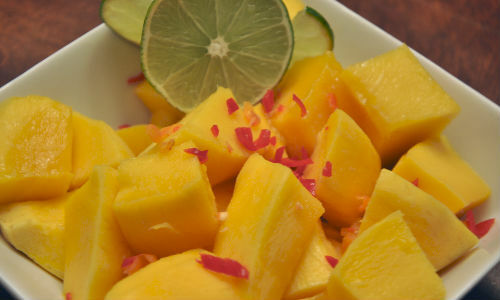 Toss all the ingredients together and let sit at room temperature for at least 20 minutes to allow the flavors to meld.